Home / News / Video / Weird / Stomach-churning video shows man squeezing goat out of a snake! Stomach-churning video shows man squeezing goat out of a snake! A man has been captured on film squeezing out two goats from the stomach of a live python with his bare hands. Onlookers were stunned after seeing a villager pressing a bloated stomach of a 6-feet long python to release two goats. According to reports, the footage was filmed on a roadside in Kerala, South India. The man was seen grabbing the giant snake’s mouth as he starts squeezing it. 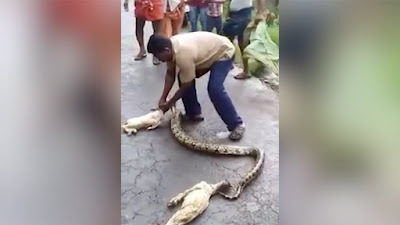 The man, risks his life as he tries to pull out the head of the baby goat from the snake, then, the man successfully managed to make the snake throw out the two goats - a mother and its baby. Unfortunately, despite the man’s best efforts, he was not able to save the goats lives because both of them died before they were even released. The giant snake is believed to have reached a highway after it sought after and consumed the goats from the nearby village of Kerala, Southern India. As the news spread, locals from the village ran in hoping to rescue the goats. They were completely shocked when they witnessed the slithering giant snake with swollen stomach on the center of the highway, incapable to move. Rescuing livelihood animals in the village is are a major source of livelihood for the farmers. The man didn’t think twice in risking his life to take on and wrestle the snake. The incident held up commuters who have been heard honking their horns in the background. While a crowd gathered to watch the incident some can be seen backing away from the terrifying reptile. There have been no reports to what happened to the python and its condition after the incident is still unknown. Watch the full jaw dropping video below and share us your thoughts on the comment section!